Lives and works in Beijing. Jonas Stampe is the curator and founder of Beijing Live. Specialized as a curator of performance art, Stampe have since 2001 produced 45 international events in different locations around the world. Curated over 1500 performance art works and worked with more than 350 artists from 56 countries. Basically an art historian with 15 years of academic research and studies at the University of Lund, Sweden and L’École des Hautes Études en Science Sociale in Paris, his Ph.D. research focused on the different artistic and critical paradigms in Paris, New York, Milan and London in the period of 1944-1965. Having finished his B.A. in 1987 he moved to Paris from Sweden, where he spent ten years researching the many archives in the French capital. As an art critic he covered different major art exhibitions around the world like Documenta, the Venice Biennial or the Whitney in New York and have published more than 200 articles. Stampe, produced and curated his first major exhibition project in 2001, the biennial of contemporary Scandinavian art, Ideologia, in Gothenburg, Sweden which was followed with a second edition in 2003 presenting some 56 artists. The Ideologia biennial made him discover the very active scene of performance art, and he became immediately passionate about the art form, and its qualities as a non-commercial, experimental yet immediate and human expression. As a result he initiated the international performance art festival, Infr’Action in Sète, France in 2005, and started in 2006 the event Live Action in Gothenburg, Sweden. In 2007 he produced and cuated the one time Franco-Chinese event Long’Action in collaboration with the Chinese Art Center in Manchester. In 2008 he started the festival, Infr’Action Paris in partnership with the Swedish Cultural Centre in the French capital and in 2009 he initiated yet another event, Live Action New York. In 2011 Jonas Stampe initiated another performance art event, Infr’Action Venezia, which is realized during four days every second year in conjunction with the professional preview of the Venice biennial. Stampe visited China for the first time in 2009 as the invited co-curator of the 10th edition of Open festival in Beijing. A visit that triggered him to start a new international performance art event in Canton the following year: Guangzhou Live. In 2013 he produced and curated the process based exhibition DigitaLive, in Canton which saw a fusion of digital art and live art, featuring eight Chinese and eight European artists. IN 2014 he was the co-curator (with Wang Chuncheng) of He Yunchang’s solo-exhibition Spring at White Box Gallery in Beijng. In 2015 he took the decision to discontinue Guangzhou Live after its 5th edition, as a result of moving to Beijing where he now is based. “It is a challenge to produce an art event like Beijing Live in one of the world’s most important and exciting art capitals. Furthermore, Beijing has a strong tradition of performance art, and some of the most important artists from an international point of view. 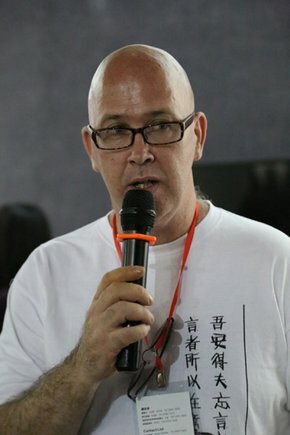 I am very pleased to work in such a positive context and I hope that my experience with producing and curating more than 350 artists from 56 countries in 45 international events since 2001 in different locations all around the world can add something to the vitality of performance art in Beijing. Since I first came to China in 2009 I have learned a lot, not least to be humble and to understand things in a long term perspective”, explains Jonas Stampe. Jonas Stampe. Guangzhou Live 4. 2013.